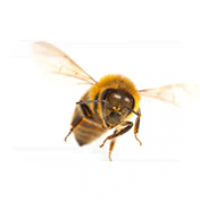 Always be cautious when approaching wasps, especially around their nest sites. Each wasp is able to inflict multiple stings making them extremely dangerous if provoked. Their stinger is primarily used for subduing and collecting other insects to feed to their larva, however it’s also used to defend themselves and their nest. 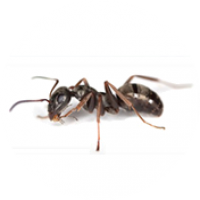 There are several types of wasps that can be problematic for home owners and I will categorize them based on the type of nest they build because it is what most people can easily recognize. Paper wasps are easily identified and very common. The nests get large and can have over 100 workers in just one. The two images below show the exposed cone (the structure of the nest itself). These nests are usually found under roof lines, decks, shudders, or some kind of overhang that protects it from the elements. The two species that are found in the N.H., Seacoast and Southern York County M.E., regions are The Yellow Ring Tail paper wasp, Fig 1, and the Brown paper wasp, Fig 2. In the late fall mated queens will look for places to hibernate for the winter and then continue the life cycle for next year. 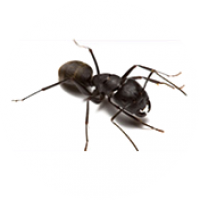 These Queens hibernate in warm, dry, places, like your attic, and around windows of the home they are able to enter. They can sometimes become a problem inside a home in the winter months if we experience an unusually warm spell, and then in early spring when they come out of hibernation. Yellow Jackets are by far one of the most dangerous insects in the N.H., seacoast and southern York county M.E., areas. These insects create the round, grayish colored, paper like nests, that you see hanging from various wooden structures. 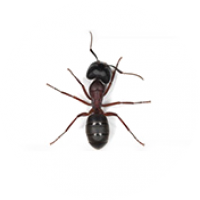 Most commonly the insects build nests that hang from houses, trees, under decking, as well as inside wall voids and attics, and even underground in the yard. Where the nest is located will depend on what species of yellow jacket inhabits the site. These nests start from one queen in the spring that makes a nest the size of a golf ball and can grow bigger than a basket ball over the summer, and can house over 1000 workers in a single nest by the end of the summer. If disturbed, threatened, or handled and treated improperly, the nest can become aggressive (sometimes without much provocation), and the situation becomes very dangerous, and anyone can be seriously attacked and injured. Fig 1, shows a typical Yellow Jacket nest. Fig. 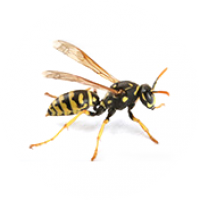 2, German Yellow Jackets will create nests by finding a crack in a wall void or an attic, and can become a problem inside the house as the nest grows and in the later part of summer when it begins to get cooler and they need warmth. Fig. 3, Shows a classic picture of a Yellow Jacket, in the cone of the nest. Bald Face Hornets are actually wasps. They are very dangerous and behave a lot like Yellow Jackets, in that it doesn’t take much to provoke them into an attack, and they have similar nest construction. Bald Face hornets are black and white in color, and about ½ inch long, as shown in Fig 1. They get their name because of their white faces which distinguishes them from all other wasps, as shown in fig 3. These insects also create nests that hang from houses, as seen in Fig. 2. Nests can hang from trees, bushes, and other wooden structures. The nests can be as large as a basket ball with up wards of a thousand workers by the end of the summer. These nests are exceedingly dangerous, they should be avoided and handled by someone qualified to deal with them. It is important to take all wasp nests seriously. 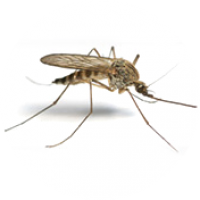 As stated previously these insects can be very dangerous with little provocation. Once they are in defense mode if you are unfortunate enough to be a target, the best action is to run away from the area of activity, and stay away. Most wasps will not chase people over very long distances away from the nest so run until they cease and then check your clothing. The wasps sometimes get caught in fabric and will continue stinging until they are killed. Again, don’t ever attempt to remove a nest if you find one on your own, go seek professional service. 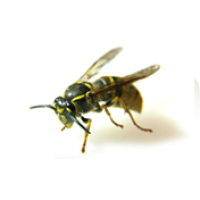 The best way to prevent wasps from nesting on or in your home is yearly service.